A melody sung by strong female voices floats through the air of the construction site, cutting thr ough the humid, skin-clinging air that blankets Gressier, Haiti. The voices float down to the edge of the palm tree-lined property, accented by the sloshing of water in buckets that are passed by the women, who form a long, continuous line while they sing Otis Redding’s “Sittin’ on the Dock of the Bay.” Children on the site clap and dance along to the tune. “I left my home in Georgia,” they belt out in unison. Indeed, each of these 10 women in the line have left their homes, their families, their jobs and their lives in the U.S. for a week long mission trip to Haiti with The Fuller Center for Housing, an international non profit dedicated to eliminating poverty housing. The group was first introduced to Haiti just a few days ago with a van ride from the airport to the hotel, an endeavor not intended for the fainthearted. Cars and vans pack the roadways here, brave cyclists wend their way in and out of traffic, bustling pedestrians make mad dashes here and there, and all fight for space where there is none. Car horns blare, music plays, people fling lyrical Creole phrases through the air. Bold splashes of color on ubiquitous hand-painted signs, corner vendors filled with bric-a-brac and women carrying baskets of ripe fruit match the constantly unfolding cacophony. That day they were also introduced – or perhaps reacquainted – with the glaring, ugly face of poverty. Most noticeable is the pervasive, acrid stench of garbage burning – Haiti has no infrastructure, no system in place to dispose of trash, so they simply burn it. Corrugated metal shacks line the roads, and children walk barefoot through the streets. Tears of compassion formed in the eyes of many of the group members, tears that would be present off and on throughout the week – but that clearly never prevented them from singing and working. This group is especially unique not only because a majority are African-American women but also because of their diverse backgrounds and professions, ranging from a math professor to a pastor to several businesswomen who own and run companies – and to HGT V personality Kimberly Lacy. “Not many African-American women are in the missions field,” says Beverly Black, director of donor development for The Fuller Center for Housing and leader of the trip. Several months ago, she and Lacy, a co-leader of the trip, decided to change that. 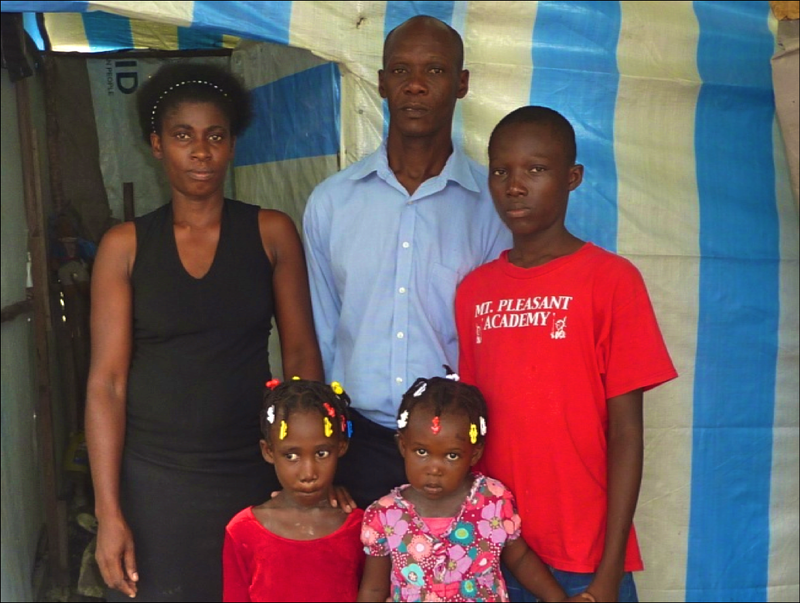 Though they’ve all come from different backgrounds, each of their brief pilgrimages here stems from a common desire and purpose – to help the Haitian people attain the basic human right of raising their families in a safe environment. The bedrock of success is the home, which is why the buckets full of water these women carry on the worksite will mix with gravel and cement to form concrete, which will form bricks that will form a house, in which, upon its completion, Fito and Kerline Jacques and their three children – Ansyto (age 14), Yuleusi (age 5) and Yunaica (age 3) – will live. The January 2010 earthquake completely destroyed the Jacques’ house in Carrefour. Since the evening of the disaster, the family hasn’t had a permanent place to lay their heads. They currently live in the Grace Village refugee camp. Fito earns some income through maintenance and grounds work. He’s also part of a start-up group of entrepreneurs who jointly own a small backyard chicken farm through the Haiti Empowerment Program. Kerline adds to the family’s income through a small business she runs in the camp. To walk through the refugee camp that Fito and Kerline share with approximately 12,000 other families is to shake hands with poverty. Children with runny noses play with handmade toys in the spaces between windowless, tarp-covered shacks. Flies buzz incessantly. Pregnant women, their bellies swollen beneath their dresses, carry buckets and baskets on their heads. Their stories represent life for the Haitian people, many of whom struggle to find and keep work and feed their children on a daily basis. 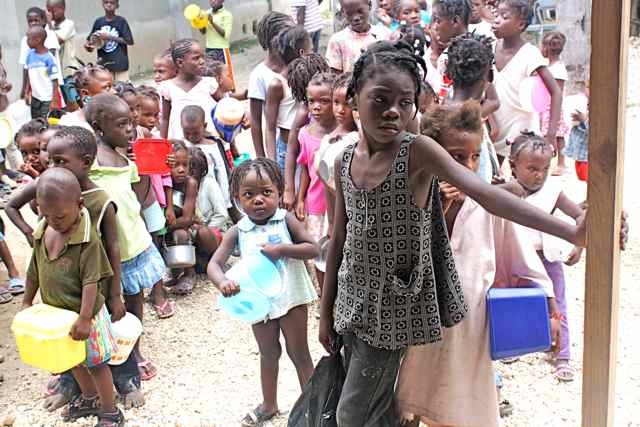 “Eighty percent of Haitians are basically on survival mode … What you see on the news is basically true,” says Jonny Jeune, director of The Fuller Center’s covenant partner organization in Haiti called Grace Fuller Center. Grace Fuller Center’s name is derived from one of The Fuller Center’s main partner organization in Haiti, Grace International, which is a Christian-based, Haitian-run organization that strives to address social issues in Haiti through the oversight and management of 270 churches, 65 schools, 3 orphanages, a medical clinic, a hospital and a home for elderly widows. But it’s an ongoing struggle to develop long-term solutions when buried by a heap of everyday problems. The overuse of charcoal, piled in buckets throughout the refugee camp, betrays this fact. People use charcoal as a cheap way to cook food. But in less than 20 years, 50 percent of the trees have been cut down for firewood and charcoal production. This creates an inefficient cycle that ultimately creates destruction on a long-term scale – deforestation causes erosion of the topsoil, which ruins healthy, sustainable agriculture for farmers and makes the country even more dependent on exports from other countries. “We need to provide solutions and alternatives. You can’t just tell a poor man not to get coal; you have to provide alternatives to coal,” Jeune says. In partnership with Project Gaia, another non profit, Grace International is working to provide such an alternative by exploring installation of an ethanol distillery and cook stoves for the families in Fuller Center homes. The problem with charcoal and deforestation is just one of many, but it’s a reminder to keep a broader, holistic perspective in mind – the homes that the Fuller Center and their teams will construct are for people with multifaceted needs. That’s why the overarching vision from the Grace International – Fuller Center partnership is summarized in a plan called the “rural sustainable community project,” which aims to ensure that the communities are ecologically, economically, and socially healthy and sustainable for generations to come. Here, the hope is that survivors can be restored back to not only normal, but also abundant and healthy living. This particular seven-acre plot in Gressier, located near the epicenter of the earthquake in Leogane and Port-Au-Prince, will eventually be filled with approximately 30 duplexes that will house a community of 60 families like the Jacques family. Each duplex costs about $3000 and are earthquake and hurricane resistant. Empowering people means making them partners in this vision. 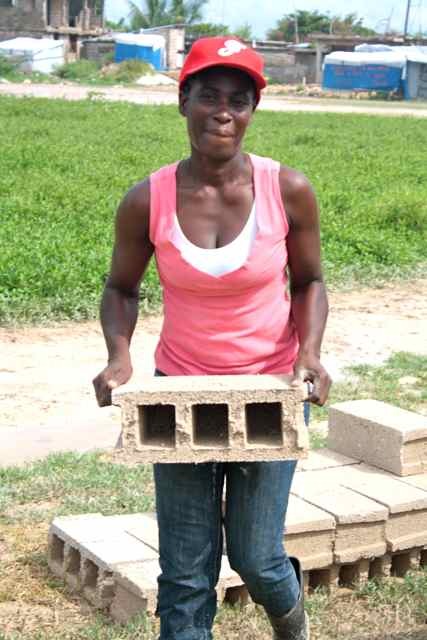 Providing a hand up instead of a hand out is the model upon which The Grace Fuller Center is building homes. 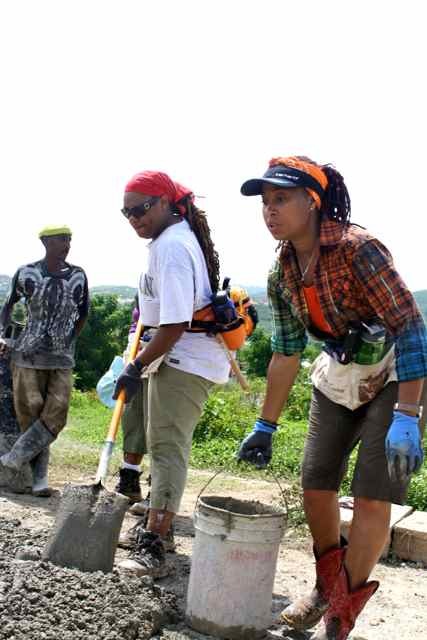 Each homeowner must contribute sweat equity hours – as such, Fito and Jacques spent many long hours toiling in the sun with this group of American women and the hired Haitian labor force on site. The Haitians are used to the manual labor – but they’re not used to the overtly ebullient spirits and songs that partially anaesthetize the workers to the hot sun and hard work. For every task, these women have a new song. And their repertoire is vast, ranging from Michael Jackson to Adele. The nearby villagers are always coming out to stare at this unusually rambunctious group. Faint smiles grace their faces, though they may not always be familiar with the songs, they pick the rhythm up quickly. The children in particular are quick to clap and dance. It’s clear that music helps the women bond with the people here – and breaks down language and culture barriers. In fact, breaking down these barriers and building bonds with people by working with them and beside them are among the main reasons these women traveled to Haiti. In their mission to build relationships in addition to homes, the women were also eager to spend a day off the construction site mid-week to help a group of women cook at the Lord’s Kitchen, a program run by Grace International that distributes rice and beans to the hungry children in the surrounding refugee camp community. The kitchen where they cook is a covered outdoor area in which women in colorful skirts and shirts pace back forth in well-worn shoes, standing over blackened and dented pots and pans that smell like supper. Their fingers search for stones in piles of black bean splits that come from a white mesh bag labeled “Peak Nutritional Power House. High fiber, low sodium.” They pluck stems off greens, knead bread, stir the rice, and sing and talk while preparing nourishment for the almost 500 kids who will soon pass through their kitchen. The Fuller Center’s group sits with the women, mimicking the comforting repetition of movements passed through the ages. They also sing, laugh and talk. In this kitchen, they’re not business people or professionals or whoever they are in the States – they’re simply women providing food for children, and that womanhood creates a distinctly communal feel that transcends culture, age, and all other differences. After a few hours of cooking, the gate to the tent community, located just 14 or so feet from kitchen, opens. Children come pouring through under the watch of a security guard. Each child carries a tin container or a plastic bucket, and the women stand ready to dole out their portions, ready to serve these small, hungry warriors of poverty. What they’re not prepared for is the way they pour out of the gates, the way they’re herded through the line like cattle, for the heartbreaking looks in their faces as they patiently hold out their tin containers, the soft-spoken “merci” they whisper when receiving the food and the way they totter off back to their dilapidated shack in a tent camp of 12,000 families. The food is also piping hot; too hot to hold for long without getting burned, but they hold it anyway in their tiny palms. Most of all, they’re not prepared for when the food runs out, when the gates close on reaching hands with empty containers and innocent faces, and the thumping noises as they beg to be let in to be fed just a cup of rice and beans today. As they finish at the kitchen, the group heads back across the yard in low spirits after facing the dire poverty of children. But through the week, the people demonstrate resilience and strength to hardship that this degree of heartbreaking poverty breeds. 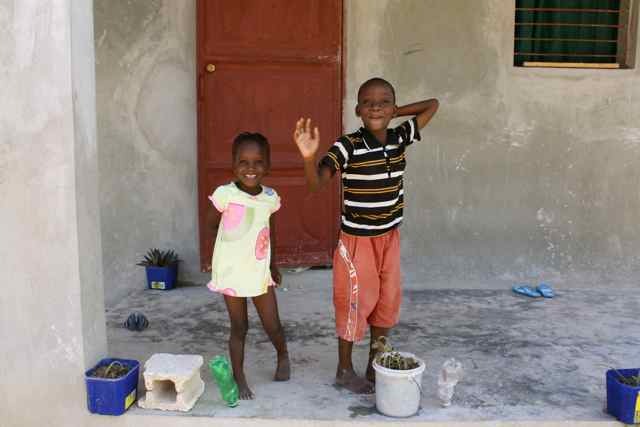 In no one is this strength more apparent than in the smallest citizens – the children of Haiti. Indeed, though these children and their parents may be economically impoverished to a desperate degree, they are extremely, almost bafflingly, affluent in community, love and faith. This is the currency on which their lives are run. 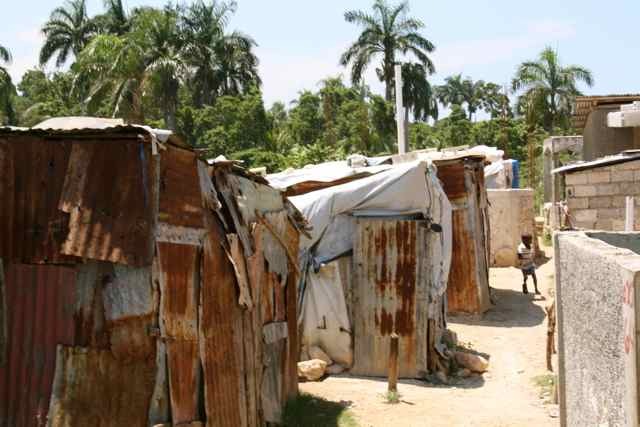 So although the headlines in the news about Haiti might be true, and though their grinding, tangible needs make that truth apparent – it’s only part of the truth. The other part is under-reported – the other side of hardship. Hardship is part of the human condition. By experiencing it, people become more sensitive to the struggles of others. Out of it strength is born and beauty, goodness and hope prevail. It’s in the flowers that curl around barbed wire fences, in the gaze of both volunteers’ and homeowners’ faces and the light that emanates from their spirits, and in colorful signs that decorate the sides of buildings, cars and buses here. This week, it’s in the songs, the meals and the work that the Haitians and this group of American women shared, and in the connections they form as women and as people. As long as the response to hardship is action instead of apathy or Pollyanna-ish optimism, this hope will continue. And although the black and white desperation engendered from the headlines in the news cannot necessarily be replaced, it can always be matched by this pulsating hope that always, always takes its place right beside hardship. These Fuller Center houses, the hands and hearts that helped build them, and most of all the people who live in them, will long stand as testament to that. 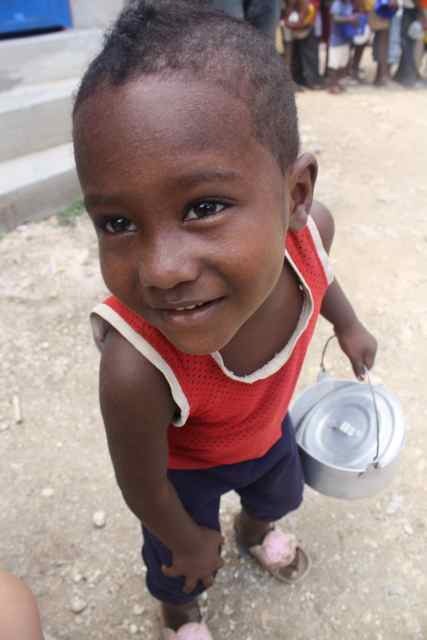 Thank you for the thorough report on the Fuller Center and the work being done in Haiti. I just posted a blog article on my site: http://globetrottingranny.com/a-trip-every-teen-should-take/. Do you have trips for teens? Teens are welcome on our Student Builders and Global Builders trips and all our volunteer opportunities. Click here to learn more.